Abby the Librarian: Do You GalleyChat? Do you know about EarlyWord's monthly Galley Chats on Twitter? They are not only super fun but can also be great collection development tools, even if you're not able to make the live discussion. I have noticed that while the adult galley chat is always robust with lots of participants, there are not as many voices joining in to the YA/middle grade chats. I would love for more of you to join us, so I thought I'd give a little rundown of what Galley Chat is and how it can be helpful. It's just what it sounds like: librarians chatting about galleys, i.e. upcoming books we're excited about. Participants share super-brief reviews of galleys they have read and/or tweet about upcoming titles they're excited about. Sometimes publishers join in to spread the word about their upcoming titles and to hear what librarians are buzzing about. There are two live Twitter chats each month - one for adult titles and one for YA/middle grade titles. You can always find the schedule for upcoming chats on EarlyWord (in the left-hand bar near the top). Typically the adult chat is the first Tuesday of the month and the YA/middle grade chat is more towards the end of the month and rotates Tuesday/Wednesday/Thursday. 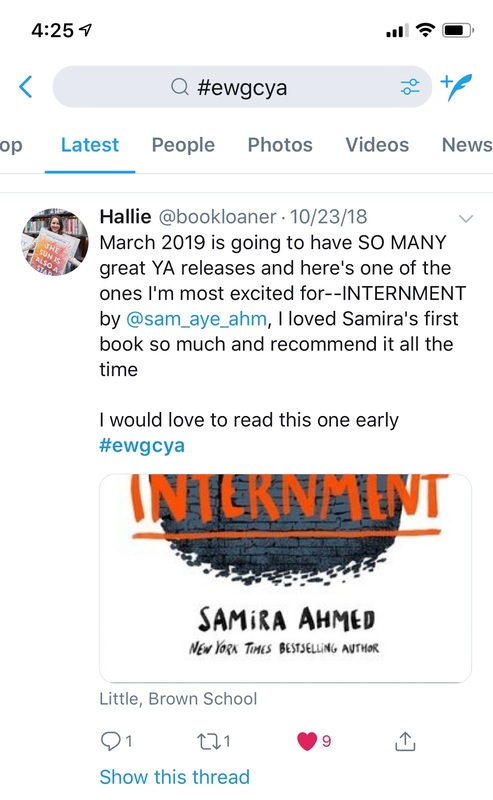 If you want to participate, all you have to do is be on Twitter at the designated time and use the hashtag #ewgc (adult) or #ewgcya (YA/middle grade) on your tweets. You can use a platform like TweetChat to help you follow the conversation, but I usually just use the Twitter website on my desktop computer. I like to have a second tab open with notifications so I can switch back and forth easily. As a collection development librarian, I find it extremely useful to participate as often as I can. Not only do I hear about all kinds of upcoming titles so I can put them on my radar, it also gives me the chance to talk up titles I've been reading. And it's a monthly reminder to be seeking out, reading, and nominating titles (especially inclusive titles!) for LibraryReads. Not to mention, it's a great way to connect with other librarians who are in the business of collection development and reader's advisory. Often I hear about new-to-me books and they're readily available as digital review copies that I can download right away. Sometimes, publishers even offer to send print ARCs to folks participating in the chat. I can't make the chat; I have a program/on desk/a meeting/etc. etc. Never fear! The wonderful folks organizing the chats compile the list of books mentioned in the chat each month. You can find them on EarlyWord.com. Participating in the chat is a fun way to meet and interact with other librarians interested in what's new and upcoming, but you can totally use these compiled lists to help with your collection development even if you can never make the meetings. I hope you'll join us for GalleyChat! The next YA/middle grade Galley Chat will be held on Wednesday, November 28 from 2:30pm-3:30pm. Mark your calendar or set a reminder on your phone; I hope to see you there! !